Thanks everyone for all the views on the video on Youtube! This video shows how I made the custom serial number and dedication plates for my Virtual Boy Arcade Cabinet. So why did I make this arcade style cabinet for my Virtual Boy? Well there were several reasons. First, I picked up an extra Virtual Boy from the local flea market for $5, but was missing the power supply, stand, and controller. I wanted to make use of this extra Virtual Boy so I would need to replace these parts. Then one day I was picking up an empty Simpson's arcade cabinet in a storage unit from a fellow collector and he showed me an Atari Battlezone he had. I had not seen one of these since the 80's. I struck me that the game's graphics looked a lot like Red Alarm (a Virtual Boy game). It also shared other things as well, the periscope style display, and it had dual joysticks, while the Virtual Boy had dual d-pads. I have always thought that the Virtual Boy was a fun and unique system that was underappreciated for several reasons. The main reason was the stand, it is this tiny, cheap almost afterthought. I often wondered if Nintendo had a designed a better stand, but then replaced it the current one to cut costs. Anyway it makes the system very uncomfortable to play. You have to always be hunched over a table to play it. Most people back in 1995 when they thought of VR they expected a headset that would be held to your head with a strap. I can imagine there are liability risks with selling a system like that, especially when little kids would be playing it. The Virtual Boy is considered to be a failure on the part of its designer Yokoi Gunpei. At Nintendo he had designed and produced some of my favorite game and systems. It seemed not right that the Virtual Boy be regarded poorly. So this cabinet was created to bring more attention to the Virtual Boy and how unique and fun it is and I have dedicated it in the memory of Yokoi Gunpei. As I said above, Atari Battlezone was a major inspiration for the design of this cabinet. The controls mimic Battlezone with how I have the dual joysticks mounted towards the center with the buttons on the outside. Also each of the joysticks are top fire sticks with the buttons mapped the L and R buttons on the Virtual Boy. I also added additional L and R buttons on the sides of the cabinet for playing Galatic Pinball, it gives the game a more authentic pinball feel. The cabinet styling is modeled after 80's Nintendo arcade cabinets like Donkey Kong, Popeye, Punch Out, etc. The base is a smaller black platform and control panel resembles a Nintendo design. 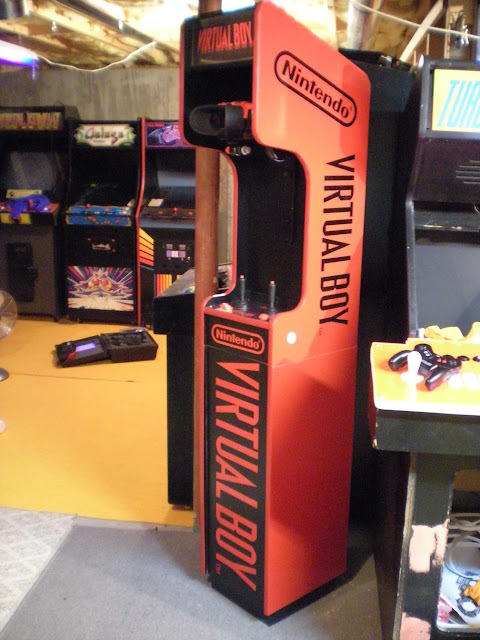 The Virtual Boy mounts on a sliding rail so that the height can be adjusted for the user. It also uses the original clamp from the Virtual Boy stand so that the Virtual Boy headset can be removed and replaced easily. 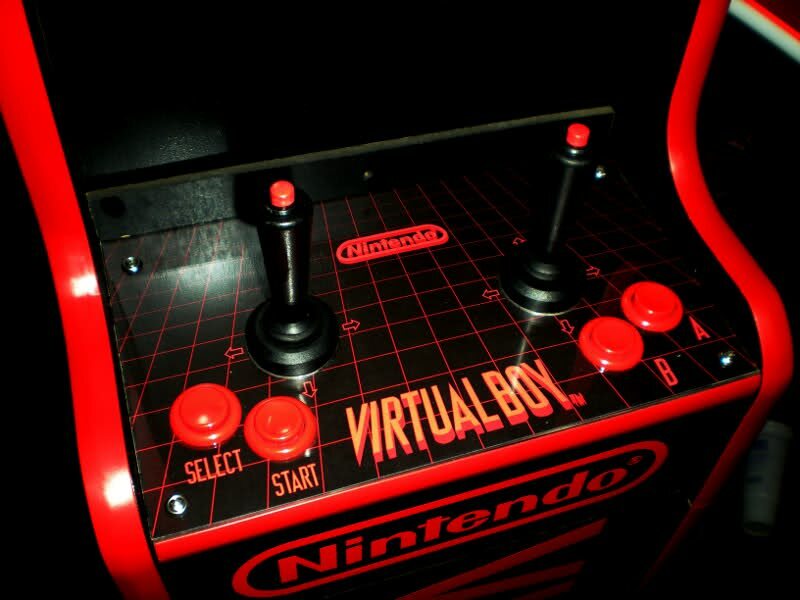 Most of the artwork on the cabinet consists of the Virtual Boy logo and Nintendo logo. A friend Ed cut out the artwork from vinyl for me, which really makes this project look like a legitimate Nintendo product. I designed the control panel graphics and marquee. I also replicated a Nintendo arcade serial plate and populated it with information from the Virtual Boy unit. 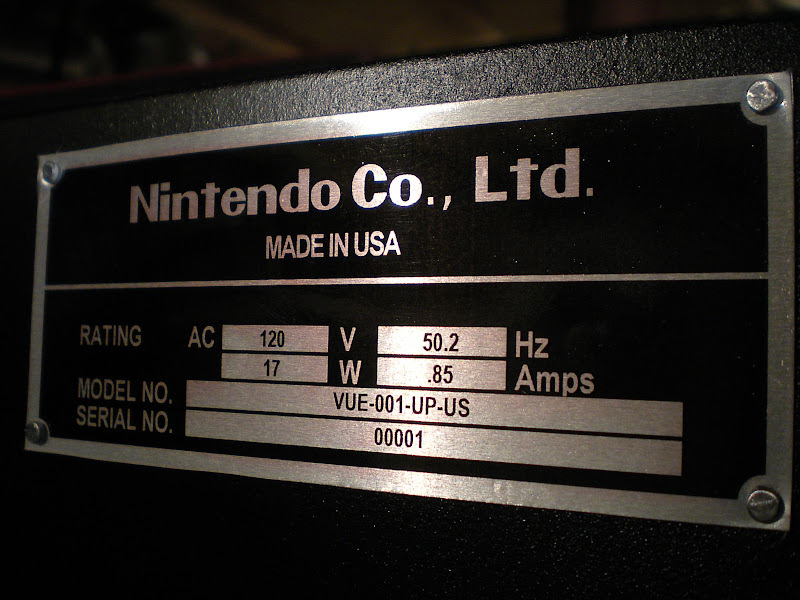 The model number of the Virtual Boy is VUE-001 made it into arcade style model number by adding " –UP-US". The UP stands for upright (the cabinet deisgn) and the US signifies the destination country. This is how Donkey Kong model numbers are done as well. 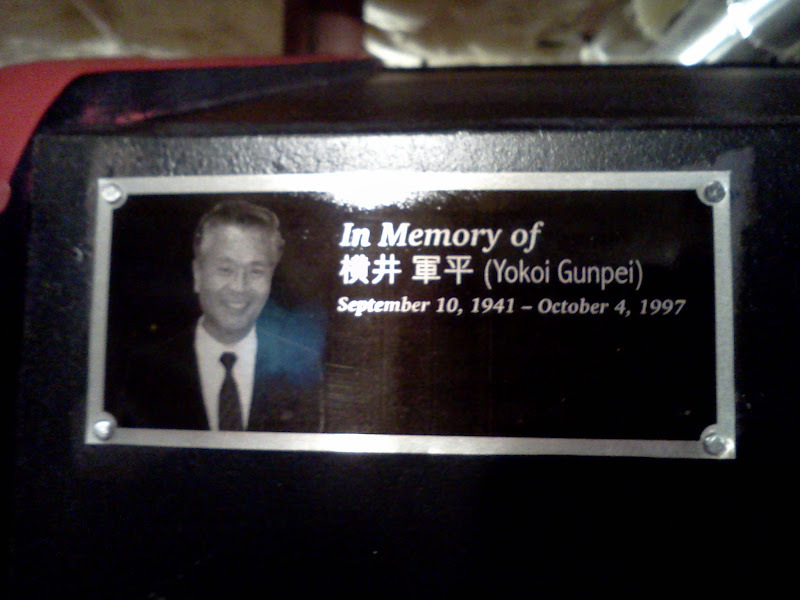 I made a dedication plaque dedicating this to the memory of Yokoi Gunpei, I hope that this is not seen as an offence to anyone. The electronics in the cabinet are fairly simple. 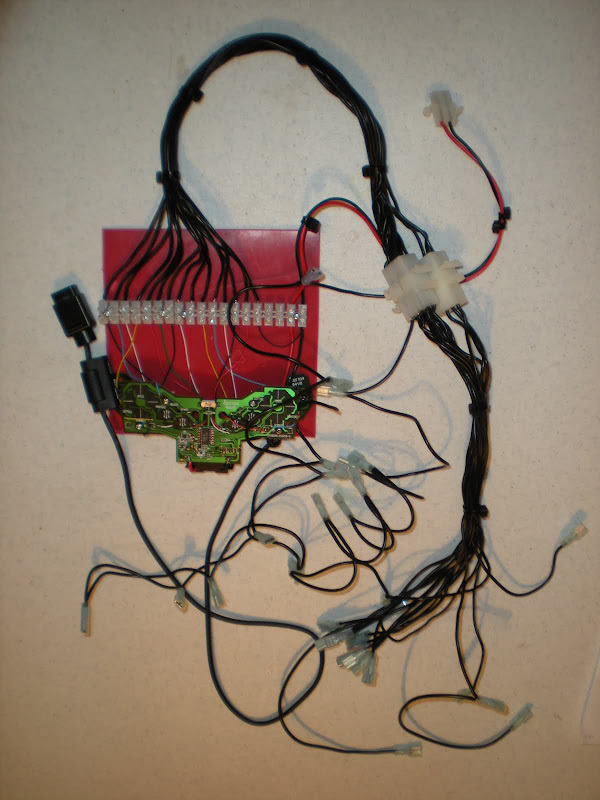 I used the circuit board out of a Virtual Boy controller and created an arcade style wiring harness from it. The power for the unit uses a standard Super Nintendo power supply. 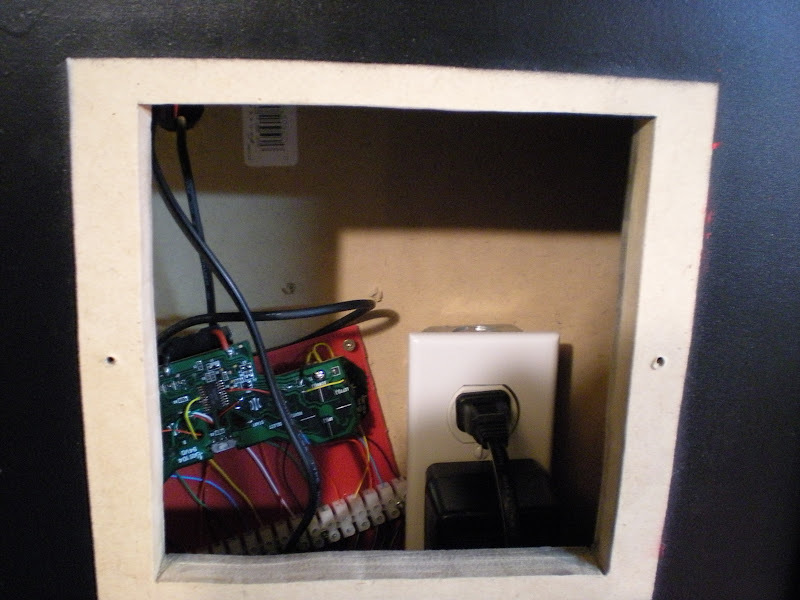 And I used a PC power supply 3 pin 120v socket on the outside for the power to the cabinet. Inside there is a standard 120v power outlet that the SNES power supply plugs into. Also the marquee light bulb plugs into the other socket. The power is turned on and off from a toggle switch on the back which turns off the power to the outlet. I have found that this cabinet really improves my enjoyment of playing the Virtual Boy. It is more fun you play it in this arcade style and less of a bother trying to find a surface to play it on. Primarily thanks got to my wife, who tolerated all the time I spent on this project when it would have been better spent with her. · I also want to thank all of the members on the KLOV forums for the encouragement and advice.